New York City's East River isn't, technically, a river: It is a tidal strait that runs between Manhattan and Queens, connecting New York Harbor to Long Island Sound. But it sure can move like one: The current can reach a top speed of more than six feet per second, enough to turn swimming upstream into a serious challenge. In the middle of the river sits Roosevelt Island, a narrow, 150-acre strip of land that serves as the home base for a company called Verdant Power. Verdant has spent the last decade trying to harness the current flowing past the island to create a new kind of green power source - one that comes from underwater turbines that look a bit like giant electric fans. "They look a lot like wind turbines, except they're smaller because they have to fit entirely underwater," said Dean Corren, Verdant's director of technology. It hasn't always been easy. The blades from one of the rotors put into the river in 2006 broke on its first day and the currents chewed up other early models to the degree that they had to be taken out of commission. The company has refined its designs since then, and it seems to have made progress: Last year, it successfully tested its latest rotor, a fiberglass and plastic composite that emerged intact, with white blades gleaming, after 10 days on the river floor. Previous models were used to power a supermarket and parking garage on Roosevelt Island, with the power flowing from the turbines into the Verdant control room and then directly into the nearby building. The newest model boasts a 16-foot diameter rotor that spins at 40 revolutions per minute; when the current is at its peak, the company says a single turbine can generate enough power for 20 to 30 homes. It isn't always at its peak, of course: The flow in the river switches four times each day, and when the river isn't moving, neither are the turbines. But the relative regularity of the tides is a selling point for hydro-power. "Water power, especially tidal power that we have here, has the benefit over wind of being totally predictable," said Corren. "I can tell you ten years from now on a Tuesday afternoon how much power we're going to be able to provide. And that's very useful for the people who run our electric grid to be able to count on that years down the road." Verdant's turbines actually switch direction with the current, rotating so that they can generate maximum power no matter which direction the river is flowing. 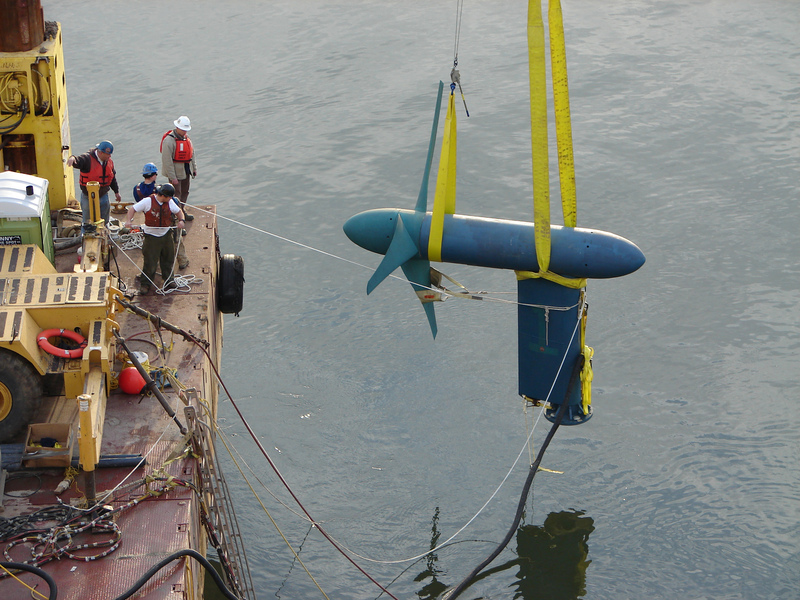 Verdant, which received the first-ever license for a tidal energy product from the U.S. Federal Energy Regulatory Commission, plans to put two more turbines in the river over the next year or two and build up from there: It has a permit to install as many as 30 turbines. In the relative short term, the company hopes to partner with Cornell University to provide power for its coming technology campus on Roosevelt Island and to potentially provide power for electric cars to be docked in the parking garage next to its control room. Over the long term, the company envisions putting larger turbines in the ocean and selling energy directly to Consolidated Edison to be used in New York City's power grid. For Corren, who wrote his thesis on the then-little-known topic of climate change as a New York University student 30 years ago, Verdant's efforts reflect the culmination of a lifelong effort to shift America toward green energy. "Being able to get [energy] cleanly in a way that's not going to harm the natural resources around us, whether its wildlife, or whether it's the entire planet through the use of fossil fuels and global warming, it's a really good feeling," he said.